This may be your first visit to the vocabulary activities glossary or maybe you are returning for the second of fifth time. Either way, welcome and enjoy the numerous words to be found here. The words are divided by story. Each story title is a link to the original vocabulary activities story where you can listen to the audio and access the original transcripts as well. Have fun and enjoy your English. I was upset to hear the president backtracked on his new policy. My boyfriend enjoys bothering me. To stop or distract someone from an uncomfortable situation. No one was speaking so I asked my mother about her day, to break the tension. For a couple to stop seeing one another. My boyfriend and I broke up in Italy. When you teach English, you need to learn how to deal with people making mistakes. To make known, to tell someone something. My mother will never disclose what happened that night. A great distance from something. I live in Spain; far away from my family in Canada. To escape or break free from someone or somewhere. I told the thief to get away from me. I would hate to lose a friend over something as petty as money. To disturb the regularity of something or someone. My mother’s comment really ruffled some feathers in the family. Self rule or self control. I don’t like to over drink, as you lose all sovereignty. I do not need a lot of stuff in my life. To daze, overwhelm or render senseless. To express a totally negative opinion of something or someone. Tearing someone’s ideas apart is not a nice thing to do. That arouses awe, astonishment, surprise, or admiration. The amount of people that visit my site daily really does create a sense of wonder! Just find a source of English that you find interesting or enjoy and explore the vocabulary with a good dictionary. 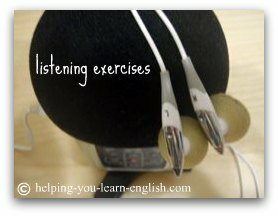 When you find vocabulary activities that you enjoy, try to incorporate audio as well. A person who cares greatly for all animals. I am an animal lover. I love animals and want to get a dog. I remember how my university professor used to bash my writing. Displaying a patronizingly superior attitude. 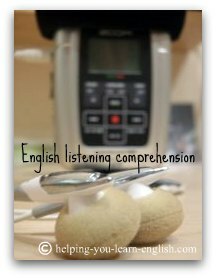 I always try to avoid being condescending, especially when I teach English. To be comforted by someone when sad or in distress. I felt bad that I could not console my friend when her cat died. The poor kitten cowered in the corner. It was scared of me. To press between two objects; break or pound; to overwhelm or oppress. Words can really affect and even crush your dreams (crush something. Don’t let them. My dilemma is that I have to choose between living with the man I love and seeing my family frequently. That was the dumbest movie I have ever seen. A small specialized mechanical or electronic device. I love playing with new gadgets; like my new digital recorder. The fire of hell, a punishment for sinners. I haven’t experience much hellfire in my life. Without companions, the sad feeling associated with being alone. Sometimes I get lonely when I think about my family and friends in Canada. Carried or moved with ease. I love my digital recorder because it is 100% portable. To talk freely and fearlessly. In my last job I didn’t speak out when I thought I wasn’t being treated well. To make or become tough. I had to toughen up, during my last job. A person who imitates or emulates another. A lot of singers are just wanna-bes. Don't try to make your life complicated. Use vocabulary activities that focus on useful and common words. For some the vocabulary here is quite advanced but it is useful all the same. –Is your “light” on or off? A sequence of events that although accidental, seems to have been planned or arranged. It was a total coincidence that Paco and I were both in Tarifa at the same time. A living being, especially an animal. To take place, or continue. I was wondering what was going on upstairs because of all the noise. Your smile could light up a room. I looked around and realized that I was alone. Despite the rain, the sun shined on. Out of the ordinary; unusual or striking. That person seemed a little strange. To stop the operation, activity, or flow of energy. I need to turn my computer off at night. To start the operation, activity or flow of energy. I turn my computer on in the morning. 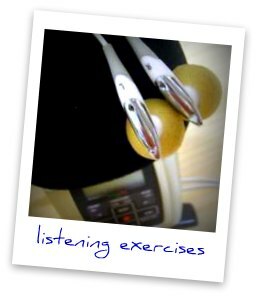 Using an mp3 player and headphones is a great way to incorporate your vocabulary activities into your daily routine. To Achieve your Dreams, Remember your ABCs! I have only ever cheated on a test once (when I was 13). Never again! I like to look at a situation from every angle, before making a decision. Last night I gave in and went out for dinner with my parents, even though I didn’t want to. I hope that you will never give up in your quest for learning English. Recurrent, often unconscious patterns of behavior that are acquired through frequent repetition. In order to improve your English faster you should try to find some good learning habits. To cling tightly to something or to continue persistently. Hang on a minute, the phone is ringing. not easily noticed or obscure. My credit card was hidden in my wallet. I try not to procrastinate but procrastinating is sometimes hard to avoid. A person who surrenders easily. I have never been called a quitter. look for a specific person or thing. You should seek out a friend who speaks English so you can practice. to reach an agreement on a price or negotiation (for something). I would like to strike a deal with Air Canada, to get cheap flights for the rest of my life. 1. Valuable or precious possessions of any kind. I have a couple treasures in my life, that I would miss greatly if someone stole them from me. Every person is unique; just like snow flakes. To increase the speed of something. My car accelerates very well. To aim directly at someone or something. I’d like to zero in on your mistakes. I hope that you have enjoyed using your English vocabulary. 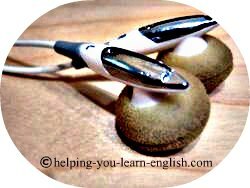 Activities like these, where you use English in an interesting way, are great for learning, remembering and applying new words in context. Vocabulary activities do not need to come from a textbook. You can create your own but collecting interesting material from newspapers, magazines, online articles and the news and highlighting all of the words that you do not understand. Then once you know the meaning and usuage I highlly recommend writing a couple of your own examples to make the idea stay in your mind. Using real examples from your life will dramatically improve the chances of remembering the word in the future. Start with these vocabulary activities and then create your very own.